I have tried to set the program to work under the MS task scheduler working from Manage Backup/Auto run. It tells me the schedule has been created, but it does not appear in the MS library, and it does not operate at the given time. I have also tried to set the schedule manually within the task scheduler itself, and it does appear in the library, but it does not work. Could you please tell me the precise wording of the command line I need to make this work? It may be worth enabling â€˜Historyâ€™ and then clicking â€˜Runâ€™ to see what the error is. Both of these options are in the right hand â€˜Actionsâ€™ section of MS Task Scheduler. Thanks Barry. Sadly, this does not help. I have tried to set up the schedule through AISB, and it appears to work. Indeed, I get the message that the schedule has been set up correctly. BUT, it does not appear in the task scheduler itself, and it does not run at the selected time. I have also tried to set the task up manually in the scheduler. I used the action command ""C:\ProgramData\Aquarius IS Consultancy\AISBackup\Database|November2016.bdb". [The name of the job is November 2016} The backup is kept on drive e:, Should I direct the scheduler there rather than the one on c:? Scheduler history shows that the job does work, but does not do the backup. The "last run" result has been either 0x0, or 0x800704c7 I think this latter is the can't find a specified file error, so have I got the command line wrong? The job is running with highest privileges. I'm stumped. Any more advice please? 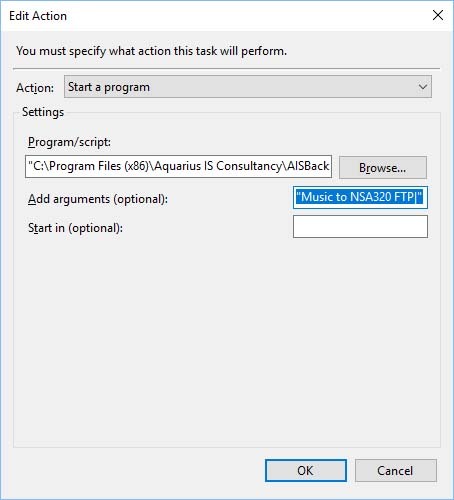 "C:\Program Files (x86)\Aquarius IS Consultancy\AISBackup\AISBACKUP.exe"
The backup job name is that shown in the 'Job name' column of the AISBackup form. Last edited by Barry on Wed Jul 25, 2018 3:42 pm, edited 1 time in total.